This Join Us For The Holidays Hiring Invitation suggests “Work at the store you already love to shop.” And as an extra benefit get an immediate 20% discount! So you will be bringing money in while you save on money going out. The perfect combination. 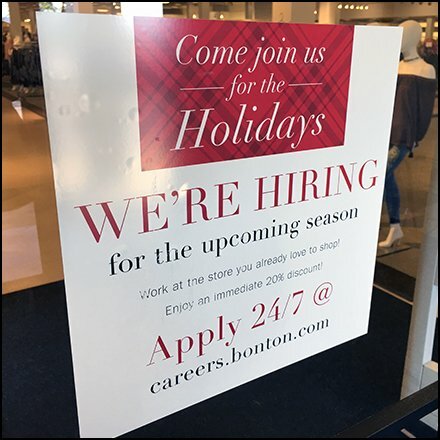 This Join Us For The Holidays Hiring Invitation seen at Bon-Ton, Wyoming Valley Mall, Wilkes-Barre PA.